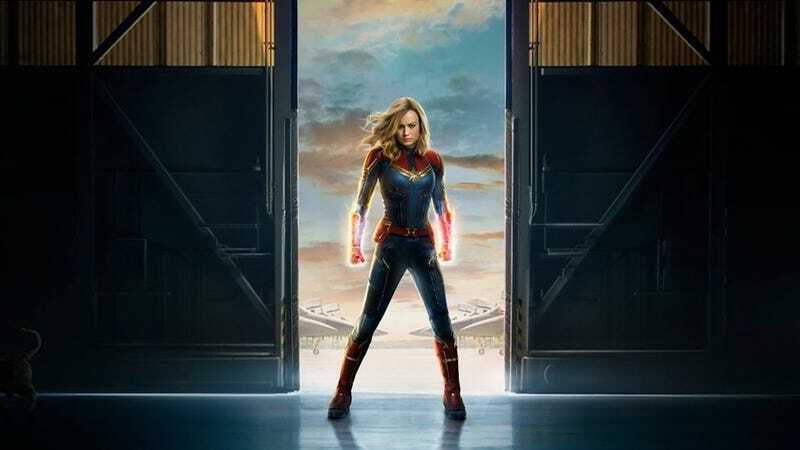 Anticipation is high for Marvel’s forthcoming 1990s-set superhero film Captain Marvel, and fans have likely already committed hours to dissecting the trailer that dropped this morning. But even the most eagle-eyed Marvel fanatics may have been too dazzled by Brie Larson’s granny-punching antics to notice an easter egg on the film’s official poster that hints at the real star of this MCU installment: A furry little cat. This isn’t just any cat. In fact, it’s not really a cat at all. It’s part of a cat-like alien race called the Flerken, and its name is Chewie. In the comics, Chewie belongs to Carol Danvers (a.k.a. Captain Marvel), and has the ability to create pocket dimensions inside his tentacle-filled mouth. Like we said—not just any cat. Of course, Chewie didn’t make an appearance in the aforementioned trailer, which means Marvel is trying really hard to keep it under wraps that this is a cat-centric film. Alternatively, this could just be a fun easter egg for people to obsess over in the long months before the film’s release. But if we don’t get to see a cat shoot tentacles out of its mouth at a shapeshifting Skrull, we’re going to be pissed.